$389/mo; 48 month lease with $0 due at signing plus tax, title, license and $179.81 doc fee. 12k mi/yr. 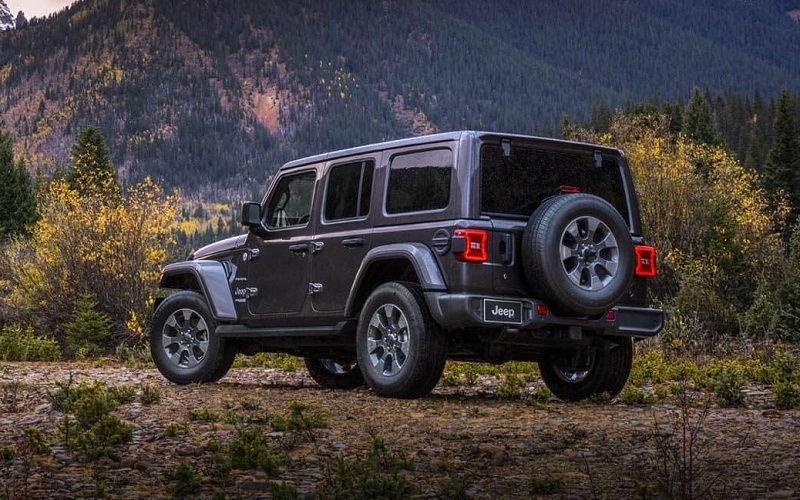 The 2019 Jeep Wrangler embodies the company’s spirit, a compact sports utility vehicle that won the world over with its ruggedness. The Wrangler storms into the 2019 model year in three trim levels: The Sport S, the Sahara and the Rubicon, and each trim comes in a thrilling four-door or a two-door model. In addition, the Sahara also becomes a limited edition Moab, named for the famous Moab Desert off-road course. The Moab remains the best off-road performer in the lineup. Taking all that into consideration, the Wrangler delivers both off-road ability and enough creature comforts to make it a practical everyday vehicle. Despite its reputation, the Wrangler travels down paved highways better than any other SUVs. On trips to the mall, the suspension feels smooth, the interior comfort surprises people, the steering is light and responsive, and it has amazing tech like blind-spot monitoring and touchscreen connectivity. The six-speed manual transmission clutches and shifts quite easily. Considering the turn ration, the parallel parking is a snap! It’s really very car-like. As such, it’s the perfect vehicle for those families interested in swapping their current sedan for a compact SUV. It’s the most genuine vehicle in its class. Check out the 2019 Jeep Wrangler in Antioch, or contact a dealer near Chicago, Gurnee, Waukegan. Ask about Wrangler specials in Antioch Illinois. The Wrangler’s famous exterior hardly needs an introduction, but a detail here and there has changed. For instance, the Jeep name has been removed from the top of the iconic grill. The tough utilitarian exterior has dominated the SUV market for decades. Everything from the rear-mounted spare tire to the front bumper with room for a winch is brimming with Jeep Wrangler details. For example, the Jeep’s body-color three-piece hard-top comes apart along with the side windows and doors to display the bare bones/roll bar wonder of a Jeep we’ve come to love. The other roof configurations include the standard soft top on the two-seaters and the Sky-One power top, a fabric/metal top that slides back to expose the seating area to sunny skies. The big windows on the side and the wide windshield offer an unobstructed vision, enabling the busy parent who wants a reliable everyday ride. There’s a new Mopar reinforced hinge-gate, outline white lettering off-road tires, heavy duty rock slider with step assist, 18″ x 7.5″ Tech Gray Polished Face Wheels, Mopar black tube steps and fender flares. The front windshield can still drop down on the hood, a feature that off-roaders prize. The loveable Jeep is such a hybrid; it’s almost the perfect compromise between the terrain-conqueror and the everyday commuter. The interior of the 2019 Jeep Wrangler in Antioch doesn’t disappoint for creature comforts. It has soft touch materials, double stitched leather seats and upholstery, a heated steering wheel, a seven-inch touchscreen, and an LCD driver information screen. Those features alone qualify this car as a winner in the family vehicle role. The audio and cruise controls on the steering wheel makes life easy and convenient for the driver. In fact, it has the full driver assist package. The leather steering wheel comes in a heated version. There’s keyless ignition in the 2019 Jeep Wrangler with push-button start for super convenient exits. The climate-controlled interior is state-of-the-art. The power steering is a must for families using the vehicle for all the chores. In the front, you’ll find Urban Jungle features like dual illuminating vanity mirrors, front and rear large size cup holders, Cargo floor mats, front and rear door pockets, rearview camera, a tilt and telescopic steering wheel, even a universal remote transmitter to open the garage, gate or to turn off your home security system. The interior filtration improves air quality. The rear parking sensors make the already maneuverable Jeep Wrangler even easier to park and an electrochromatic inside rearview mirror automatically dim the mirror’s reflection of bright trailing lights. Try out the new Jeep Wrangler near Chicago, Gurnee, Waukegan. In Antioch Illinois, check out Wrangler Specials! Its reputation for rugged driving notwithstanding, the Jeep has surprised drivers with its acceleration, and the 2019 Jeep Wrangler provides enough speed for everybody. The 285-hp, 3.6-liter V-6 gas engine has enough pop from a standing position and you can try out a turbocharged inline four-cylinder if you want to try something different. With features like Traction control, Brake assist, four-wheel ABS brakes, brake assistance, electronic stability control with anti-roll ability and a 6-speed manual with overdrive, this Jeep is ready to go anywhere. The mileage is 17 mpg city and 23 mpg country. The turbocharged engine is yoked to an eight-speed automatic transmission with sport mode. Try out the new Jeep Wrangler near Chicago, Gurnee, Waukegan. 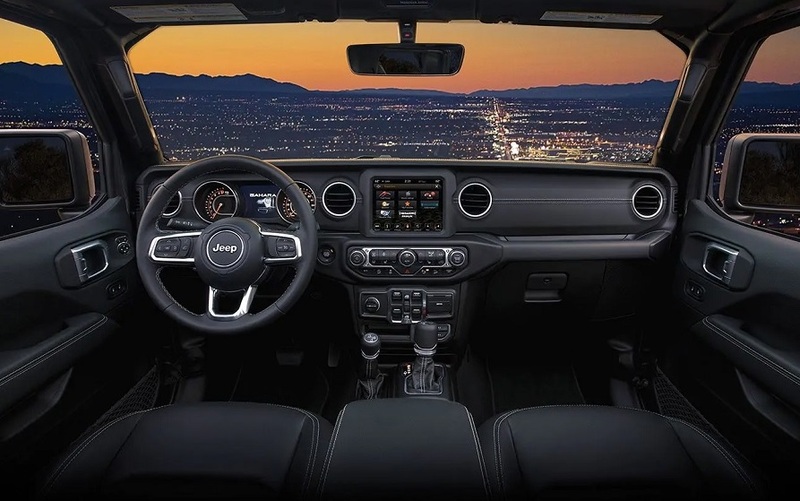 The 2019 Jeep Wrangler in Antioch Illinois waits for your test drive. Ask about Wrangler specials when you visit. To say the Jeep Wrangler is only an off-road vehicle is to completely miss everything the Wrangler has to offer in 2019. This vehicle is as easy to load up with child-seats as it is to load extra tanks of water for desert excursions. Visit a dealer today for a test drive. If you ever thought about the Jeep as one-dimensional, you can learn a lot more about this compact SUV today. Contact your dealer and discover the truth. While you’re there, ask about current specials. 2019 Jeep Wrangler Sport We make it easy !!! We are excited to offer you great quality vehicle at a competitive and affordable price. We offer new, used and cerified Chrysler, Dodge, Jeep and RAM vehicles. Come visit Wrangler headquarters! We also carry an extensive selection of used cars, trucks and SUVs by other manufacturers. Our experienced and certified sales staff can point you in the right direction based on your individual vehicle needs. We also offer competitive financing, top tier service and a fully stocked inventory of Chrysler, Dodge and Jeep automotive parts. Here at Antioch Chrysler Dodge Jeep, our motto is " Nobody sells vehicles for less" and we stand by that. Priced below KBB Fair Purchase Price! 2019 Jeep Wrangler Sport We make it easy !!! We are excited to offer you great quality vehicle at a competitive and affordable price. We offer new, used and cerified Chrysler, Dodge, Jeep and RAM vehicles. Come visit Wrangler headquarters! We also carry an extensive selection of used cars, trucks and SUVs by other manufacturers. Our experienced and certified sales staff can point you in the right direction based on your individual vehicle needs. We also offer competitive financing, top tier service and a fully stocked inventory of Chrysler, Dodge and Jeep automotive parts. Here at Antioch Chrysler Dodge Jeep, our motto is " Nobody sells vehicles for less" and we stand by that. Priced below KBB Fair Purchase Price! 2019 Jeep Wrangler Sport S ABS brakes, Compass, Electronic Stability Control, Low tire pressure warning, Traction control. We make it easy !!! We are excited to offer you great quality vehicle at a competitive and affordable price. We offer new, used and cerified Chrysler, Dodge, Jeep and RAM vehicles. Come visit Wrangler headquarters! We also carry an extensive selection of used cars, trucks and SUVs by other manufacturers. Our experienced and certified sales staff can point you in the right direction based on your individual vehicle needs. We also offer competitive financing, top tier service and a fully stocked inventory of Chrysler, Dodge and Jeep automotive parts. Here at Antioch Chrysler Dodge Jeep, our motto is " Nobody sells vehicles for less" and we stand by that. 2019 Jeep Wrangler Sport S ABS brakes, Compass, Electronic Stability Control, Low tire pressure warning, Traction control. We make it easy !!! We are excited to offer you great quality vehicle at a competitive and affordable price. We offer new, used and cerified Chrysler, Dodge, Jeep and RAM vehicles. Come visit Wrangler headquarters! We also carry an extensive selection of used cars, trucks and SUVs by other manufacturers. Our experienced and certified sales staff can point you in the right direction based on your individual vehicle needs. We also offer competitive financing, top tier service and a fully stocked inventory of Chrysler, Dodge and Jeep automotive parts. Here at Antioch Chrysler Dodge Jeep, our motto is " Nobody sells vehicles for less" and we stand by that.